Fluorescent minerals: One of the most spectacular museum exhibits is a dark room filled with fluorescent rocks and minerals that are illuminated with ultraviolet light. They glow with an amazing array of vibrant colors - in sharp contrast to the color of the rocks under conditions of normal illumination. The ultraviolet light activates these minerals and causes them to temporarily emit visible light of various colors. This light emission is known as "fluorescence." 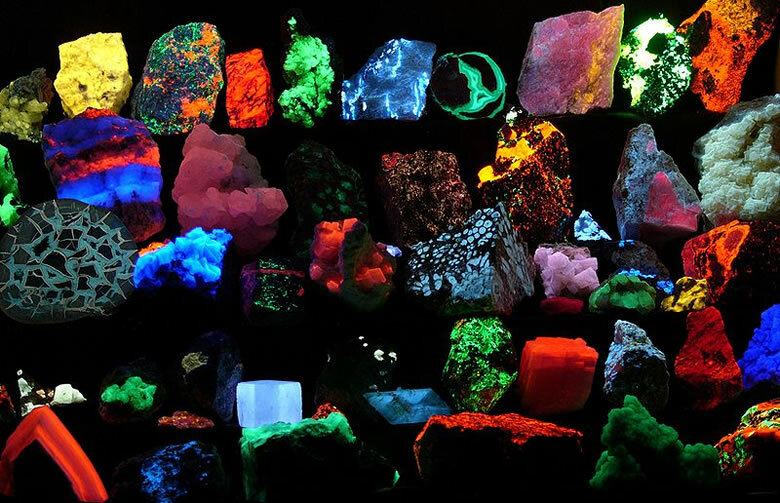 The wonderful photograph above shows a collection of fluorescent minerals. It was created by Dr. Hannes Grobe and is part of the Wikimedia Commons collection. The photo is used here under a Creative Commons license. Fluorescent mineral key: This sketch is a key to the fluorescent rocks and minerals in the large color image at the top of this page. The fluorescent minerals in each specimen are: 1. Cerussite, Barite - Morocco; 2. Scapolite - Canada; 3. Hardystonite (blue), Calcite (red), Willemite (green) - New Jersey; 4. Dolomite - Sweden; 5. Adamite - Mexico; 6. Scheelite - unknown locality; 7. Agate - Utah; 8. Tremolite - New York; 9. Willemite - New Jersey; 10. Dolomite - Sweden; 11. Fluorite, Calcite - Switzerland; 12. Calcite - Romania; 13. Rhyolite - unknown locality; 14. Dolomite - Sweden; 15. Willemite (green), Calcite (red), Franklinite, Rhodonite - New Jersey; 16. Eucryptite - Zimbabwe; 17. Calcite - Germany; 18. Calcite in a Septarian nodule - Utah; 19. Fluorite - England; 20. Calcite - Sweden; 21. Calcite, Dolomite - Sardinia; 22. Dripstones - Turkey; 23. Scheelite - unknown locality; 24. Aragonite - Sicily; 25. Benitoite - California; 26. Quartz Geode - Germany; 27. Dolomite, Iron Ore - Sweden; 28. Unknown; 29. Synthetic Corundum; 30. Powellite - India; 31. Hyalite (opal) - Hungary; 32. Vlasovite in Eudyalite - Canada; 33. Spar Calcite - Mexico; 34. Manganocalcite? - Sweden; 35. Clinohydrite, Hardystonite, Willemite, Calcite - New Jersey; 36. Calcite - Switzerland; 37. Apatite, Diopside - United States; 38. Dolostone - Sweden; 39. Fluorite - England; 40. Manganocalcite - Peru; 41. Hemimorphite with Sphalerite in gangue - Germany; 42. Unknown; 43. Unknown; 44. Unknown; 45. Dolomite - Sweden; 46. Chalcedony - unknown locality; 47 Willemite, Calcite - New Jersey. This image was produced by Dr. Hannes Grobe and is part of the Wikimedia Commons collection. It is used here under a Creative Commons license. What is a Fluorescent Mineral? All minerals have the ability to reflect light. That is what makes them visible to the human eye. Some minerals have an interesting physical property known as "fluorescence." These minerals have the ability to temporarily absorb a small amount of light and an instant later release a small amount of light of a different wavelength. This change in wavelength causes a temporary color change of the mineral in the eye of a human observer. The color change of fluorescent minerals is most spectacular when they are illuminated in darkness by ultraviolet light (which is not visible to humans) and they release visible light. The photograph above is an example of this phenomenon. How fluorescence works: Diagram that shows how photons and electrons interact to produce the fluorescence phenomenon. The wavelength of light released from a fluorescent mineral is often distinctly different from the wavelength of the incident light. This produces a visible change in the color of the mineral. This "glow" continues as long as the mineral is illuminated with light of the proper wavelength. How Many Minerals Fluoresce in UV Light? Most minerals do not have a noticeable fluorescence. Only about 15% of minerals have a fluorescence that is visible to people, and some specimens of those minerals will not fluoresce. Fluorescence usually occurs when specific impurities known as "activators" are present within the mineral. These activators are typically cations of metals such as: tungsten, molybdenum, lead, boron, titanium, manganese, uranium, and chromium. Rare earth elements such as europium, terbium, dysprosium, and yttrium are also known to contribute to the fluorescence phenomenon. Fluorescence can also be caused by crystal structural defects or organic impurities. In addition to "activator" impurities, some impurities have a dampening effect on fluorescence. If iron or copper are present as impurities, they can reduce or eliminate fluorescence. Furthermore, if the activator mineral is present in large amounts, that can reduce the fluorescence effect. Most minerals fluoresce a single color. Other minerals have multiple colors of fluorescence. Calcite has been known to fluoresce red, blue, white, pink, green, and orange. Some minerals are known to exhibit multiple colors of fluorescence in a single specimen. These can be banded minerals that exhibit several stages of growth from parent solutions with changing compositions. Many minerals fluoresce one color under shortwave UV light and another color under longwave UV light. 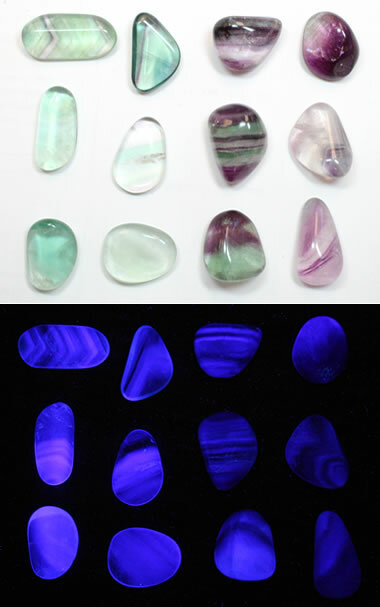 Fluorite: Tumble-polished specimens of fluorite in normal light (top) and under shortwave ultraviolet light (bottom). The fluorescence appears to be related to the color and banding structure of the minerals in plain light, which could be related to their chemical composition. Fluorite: The Original "Fluorescent Mineral"
One of the first people to observe fluorescence in minerals was George Gabriel Stokes in 1852. He noted the ability of fluorite to produce a blue glow when illuminated with invisible light "beyond the violet end of the spectrum." He called this phenomenon "fluorescence" after the mineral fluorite. The name has gained wide acceptance in mineralogy, gemology, biology, optics, commercial lighting and many other fields. Many specimens of fluorite have a strong enough fluorescence that the observer can take them outside, hold them in sunlight, then move them into shade and see a color change. Only a few minerals have this level of fluorescence. Fluorite typically glows a blue-violet color under shortwave and longwave light. Some specimens are known to glow a cream or white color. Many specimens do not fluoresce. Fluorescence in fluorite is thought to be caused by the presence of yttrium, europium, samarium  or organic material as activators. 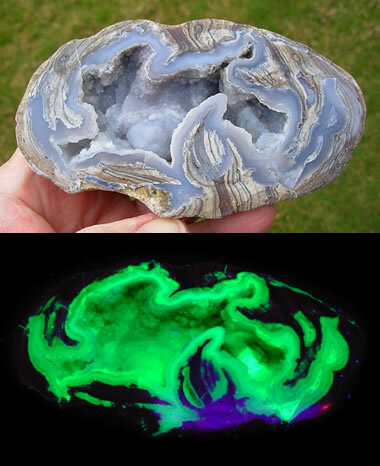 You might be surprised to learn that some people have found geodes with fluorescent minerals inside. Some of the Dugway geodes, found near the community of Dugway, Utah, are lined with chalcedony that produces a lime-green fluorescence caused by trace amounts of uranium. Dugway geodes are amazing for another reason. They formed several million years ago in the gas pockets of a rhyolite bed. Then, about 20,000 years ago they were eroded by wave action along the shoreline of a glacial lake and transported several miles to where they finally came to rest in lake sediments. Today, people dig them up and add them to geode and fluorescent mineral collections. 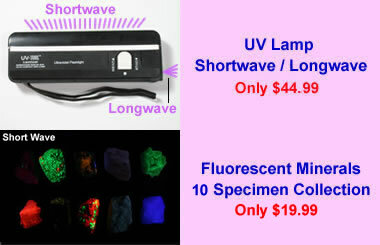 UV lamps: Three hobbyist-grade ultraviolet lamps used for fluorescent mineral viewing. 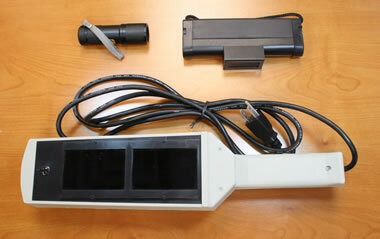 At top left is a small "flashlight" style lamp that produces longwave UV light and is small enough to easily fit in a pocket. At top right is a small portable shortwave lamp. The lamp at bottom produces both longwave and shortwave light. The two windows are thick glass filters that eliminate visible light. The larger lamp is strong enough to use in taking photographs. UV-blocking glasses or goggles should always be worn when working with a UV lamp. Scientific-grade lamps are produced in a variety of different wavelengths. The table above lists the wavelength ranges that are most often used for fluorescent mineral studies and their common abbreviations. The scientific-grade lamps used for mineral studies have a filter that allows UV wavelengths to pass but blocks most visible light that will interfere with observation. These filters are expensive and are partly responsible for the high cost of scientific lamps. We offer a 4 watt UV lamp with a small filter window that is suitable for close examination of fluorescent minerals. We also offer a small collection of shortwave and longwave fluorescent mineral specimens. Fluorescent spodumene: This spodumene (gem-variety kunzite) provides at least three important lessons in mineral fluorescence. All three photos show the same scatter of specimens. The top is in normal light, the center is in shortwave ultraviolet, and the bottom is in longwave ultraviolet. Lessons: 1) a single mineral can fluoresce with different colors; 2) the fluorescence can be different colors under shortwave and longwave light; and, 3) some specimens of a mineral will not fluoresce. Ultraviolet wavelengths of light are present in sunlight. They are the wavelengths that can cause sunburn. UV lamps produce the same wavelengths of light along with shortwave UV wavelengths that are blocked by the ozone layer of Earth's atmosphere. Small UV lamps with just a few watts of power are safe for short periods of use. The user should not look into the lamp, shine the lamp directly onto the skin, or shine the lamp towards the face of a person or pet. Looking into the lamp can cause serious eye injury. Shining a UV lamp onto your skin can cause "sunburn." Eye protection should be worn when using any UV lamp. Inexpensive UV blocking glasses, UV blocking safety glasses, or UV blocking prescription glasses provide adequate protection when using a low-voltage ultraviolet lamp for short periods of time for specimen examination. The safety procedures of UV lamps used for fluorescent mineral studies should not be confused with those provided with the "blacklights" sold at party and novelty stores. "Blacklights" emit low-intensity longwave UV radiation. The shortwave UV radiation produced by a mineral study lamp contains the wavelengths associated with sunburn and eye injury. This is why mineral study lamps should be used with eye protection and handled more carefully than "blacklights." UV Lamp and Minerals: The Geology.com Store offers an inexpensive ultraviolet lamp and a small fluorescent mineral collection. These are suitable for student use, and the lamp is accompanied by a pair of UV-blocking safety glasses. Fluorescence has practical uses in mining, gemology, petrology, and mineralogy. The mineral scheelite, an ore of tungsten, typically has a bright blue fluorescence. Geologists prospecting for scheelite and other fluorescent minerals sometimes search for them at night with ultraviolet lamps. Geologists in the oil and gas industry sometimes examine drill cuttings and cores with UV lamps. Small amounts of oil in the pore spaces of the rock and mineral grains stained by oil will fluoresce under UV illumination. The color of the fluorescence can indicate the thermal maturity of the oil, with darker colors indicating heavier oils and lighter colors indicating lighter oils. Fluorescent lamps can be used in underground mines to identify and trace ore-bearing rocks. They have also been used on picking lines to quickly spot valuable pieces of ore and separate them from waste. Many gemstones are sometimes fluorescent, including ruby, kunzite, diamond, and opal. This property can sometimes be used to spot small stones in sediment or crushed ore. It can also be a way to associate stones with a mining locality. For example: light yellow diamonds with strong blue fluorescence are produced by South Africa's Premier Mine, and colorless stones with a strong blue fluorescence are produced by South Africa's Jagersfontein Mine. The stones from these mines are nicknamed "Premiers" and "Jagers." Fluorescence is not routinely used in mineral identification. Most minerals are not fluorescent, and the property is unpredictable. Calcite provides a good example. Some calcite does not fluoresce. Specimens of calcite that do fluoresce glow in a variety of colors, including red, blue, white, pink, green, and orange. Fluorescence is rarely a diagnostic property. 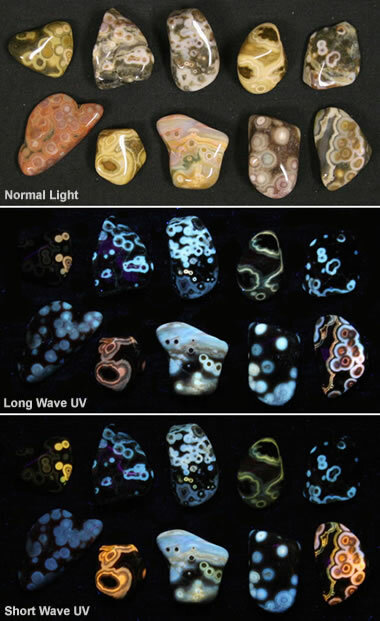 Fluorescent ocean jasper: This image shows some pieces of tumbled ocean jasper under normal light (top), longwave ultraviolet (center), and shortwave ultraviolet (bottom). It shows how materials respond to different types of light. 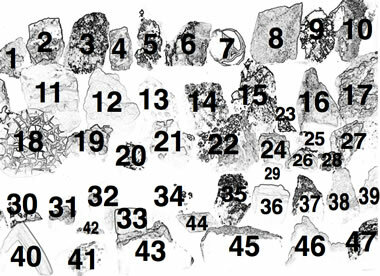 Specimens and photos by RockTumbler.com, a partner site of Geology.com. Two excellent introductory books about fluorescent minerals are: Collecting Fluorescent Minerals and The World of Fluorescent Minerals, both by Stuart Schneider. These books are written in easy-to-understand language, and each of them has a fantastic collection of color photographs showing fluorescent minerals under normal light and different wavelengths of ultraviolet light. They are great for learning about fluorescent minerals and serve as valuable reference books. Basic Concepts in Fluorescence: Michael W. Davidson and others, Optical Microscopy Primer, Florida State University, last accessed October 2016. Fluorescent Minerals: James O. Hamblen, a website about fluorescent minerals, Georgia Tech, 2003. The World of Fluorescent Minerals, Stuart Schneider, Schiffer Publishing Ltd., 2006. Collecting Fluorescent Minerals, Stuart Schneider, Schiffer Publishing Ltd., 2004. Ultraviolet Light Safety: Connecticut High School Science Safety, Connecticut State Department of Education, last accessed October 2016. A Contribution to Understanding the Effect of Blue Fluorescence on the Appearance of Diamonds: Thomas M. Moses and others, Gems and Gemology, Gemological Institute of America, Winter 1997. In fluorescence, electrons excited by incoming photons jump up to a higher energy level and remain there for a tiny fraction of a second before falling back to the ground state and emitting fluorescent light. In phosphorescence, the electrons remain in the excited state orbital for a greater amount of time before falling. Minerals with fluorescence stop glowing when the light source is turned off. Minerals with phosphorescence can glow for a brief time after the light source is turned off. Minerals that are sometimes phosphorescent include calcite, celestite, colemanite, fluorite, sphalerite, and willemite. Thermoluminescence is the ability of a mineral to emit a small amount of light upon being heated. This heating might be to temperatures as low as 50 to 200 degrees Celsius - much lower than the temperature of incandescence. Apatite, calcite, chlorophane, fluorite, lepidolite, scapolite, and some feldspars are occasionally thermoluminescent. Some minerals will emit light when mechanical energy is applied to them. These minerals glow when they are struck, crushed, scratched, or broken. This light is a result of bonds being broken within the mineral structure. The amount of light emitted is very small, and careful observation in the dark is often required. Minerals that sometimes display triboluminescence include amblygonite, calcite, fluorite, lepidolite, pectolite, quartz, sphalerite, and some feldspars.